This is one of my favorite Korean comfort foods. 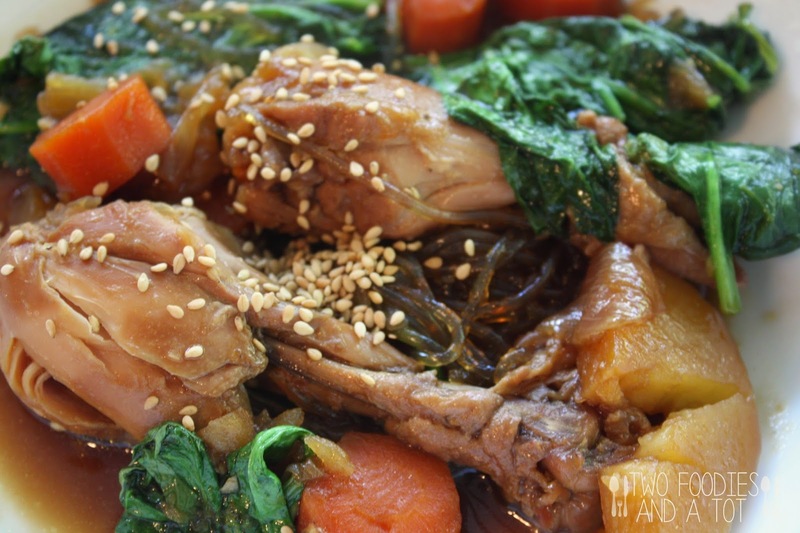 Chewy glass noodle with tender chicken with lots of veggies. Salty, sweet and spicy sauce. So flavorful. You probably noticed a different name for this dish in brackets. That's the name for this dish in Korean. 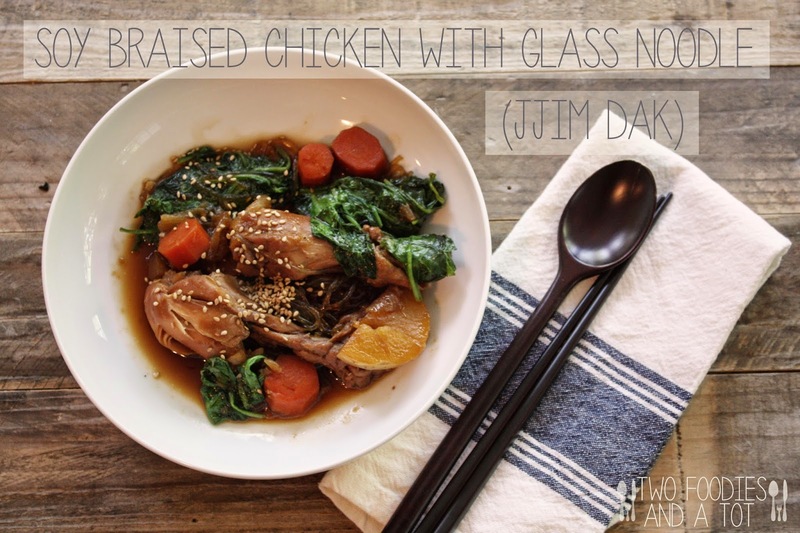 Jjim means steamed or braised and Dak means chicken. This dish is not usually served at most Korean restaurants outside of Korea and even in Korea, there are specialty Jjimdak restaurants that only sell this dish. Just one thing on the menu and these restaurants are usually packed. You really don't have to sprinkle anything at all as garnish but my tot insisted on "helping" me and he wanted to add a little bit of his touch so i let him do what he wanted, and this happened. A big pile of sesame seeds. Thanks for the "help" sweetie. 1. Boil a pot of water and cook chicken for 15 minutes or so. 2. Meanwhile mix all the sauce ingredients in a bowl. In a large skillet with a lid, add all the cut vegetables and cooked chicken and pour the sauce on top. Bring it to boil. Cover and simmer for 40minutes or so. 3. Soak the glass noodle in hot water completely covering the noodle while simmering the chicken. When ready to serve, add noodle and 1/2 cup water to the skillet and cook on high for 4 minutes or until noodle's ready to your liking. 4. Turn the heat off, add spinach and stir. When spinach is wilted, plate and serve.